What is Adobe ColdFusion Builder? Adobe ColdFusion Builder is a comprehensive platform for professional developers who need to build and deploy web and mobile applications. Developed by Adobe Systems Incorporated, the software has a smart tab assist that uses keyboard shortcuts to quickly navigate to the next logical tag, function, or control statement within a code. An advanced find-and-replace function easily searches applications for specific tags, attributes and text from any file location. Integrated task management allows users to set “to-do” and “fix me” points within their code. These easily identifies sections and resumes development where they left off. Adobe ColdFusion Builder comes with built-in tools that are designed to increase productivity by helping with every detail of an app development workflow. Developers can maintain code integrity with smart solutions that are capable of recognizing and avoiding errors, vulnerabilities, and security threats. Users can develop projects more rapidly and maximize their time with the aid of ColdFusion Builder tools that streamline repetitive tasks. Aside from allowing developers to program more quickly, this easy-to-use functionality makes searching and navigating codes less tedious. 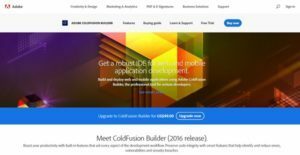 Given the rapid growth of digital programs, even newbie developers can get a head start in today’s competitive mobile and web apps market with the help of ColdFusion Builder. The software boasts of solutions that help in every aspect of making an application – from development, to testing, debugging, and rollout. ColdFusion Builder boasts of comprehensive and reliable debugging tools, preview functions, refactoring capabilities, and other solutions to virtually guarantee code quality. Features aid in recognizing and eliminating errors, vulnerabilities, and potential security breaches. Features such as extensions, remote project support, integrated server management, a log viewer, and other workflow streamlining tools allow developers to manage their ColdFusion server more efficiently. The software also allows users to customize their environment exactly the way they work best. With ColdFusion Builder, one can use custom-made shortcuts, easily format and resuse codes, and utilize extensions to add functions. If you are interested in Adobe ColdFusion Builder it might also be beneficial to analyze other subcategories of Best IDE Software collected in our database of B2B software reviews. Companies have unique wants and requirements and no software application can be perfect in such a scenario. It is pointless to try to find a perfect out-of-the-box software app that fulfills all your business requirements. The intelligent thing to do would be to modify the solution for your unique wants, worker skill levels, finances, and other aspects. For these reasons, do not hurry and pay for well-publicized leading systems. Though these may be widely used, they may not be the ideal fit for your specific needs. Do your research, check out each short-listed system in detail, read a few Adobe ColdFusion Builder reviews, call the vendor for explanations, and finally choose the application that offers what you want. How Much Does Adobe ColdFusion Builder Cost? We realize that when you make a decision to buy IDE Software it’s important not only to see how experts evaluate it in their reviews, but also to find out if the real people and companies that buy it are actually satisfied with the product. That’s why we’ve created our behavior-based Customer Satisfaction Algorithm™ that gathers customer reviews, comments and Adobe ColdFusion Builder reviews across a wide range of social media sites. The data is then presented in an easy to digest form showing how many people had positive and negative experience with Adobe ColdFusion Builder. With that information at hand you should be equipped to make an informed buying decision that you won’t regret. What are Adobe ColdFusion Builder pricing details? What integrations are available for Adobe ColdFusion Builder?